During exposure to cold environment, shivering of the body is seen, which is nothing but the involuntary contraction of skeletal muscles, which raises the heat production. Increase in appetite and increased metabolism are other factors that cause rise in body heat. Somatic changes include the increased physical activity, which helps to increase the heat production. The heat production is also increased by stimulating metabolism. This is achieved by increased secretion of catecholamines and thyroxine, which show calorigenic effect. The rise in BMR from this effect, increases the body temperature. In infants, brown fat in the body is utilised for increased metabolism, to raise the body temperature when there is cold exposure. 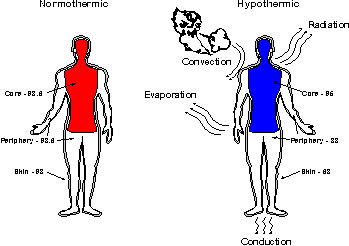 Behavioural response to the cold exposure shows curling of the body, wearing of woolen clothes and use of room heaters. When the body temperature is raised more than 102oC, the symptoms of hyperthermia can be seen. Chronic exposure to hyperthermia causes heat stroke. The symptoms are due to dehydration and salt loss. The circulatory shock that develops can lead to death if immediate correction of the fluid and electrolyte loss is not done. Hyperthermia is also seen in fever. The rise in body temperature during fever is believed to be a physiological adaptation, because, the high temperature is not conducive for the growth of bacteria. The mechanism for the rise in body temperature during fever is due to the action of bacterial toxins on macrophages, which secrete cytokines and interleukins (IL 1, IL 6). These in turn stimulate the formation of prostaglandins, which raises the set point of the thermostat, and hence the body temperature rises. Antipyretics stop the production of prostaglandin, which causes the set point of thermostat to come back to normal. Fall in body temperature between 30-25oC can lead to hypothermia. The oxygen consumption of the tissues is reduced, so also, the heart rate and blood pressure. Hypothermia is used in the surgery of heart and brain to reduce the blood flow in these organs. The body temperature is brought to 25oC before doing the surgery.